12 pontoons on the lower end of the construction to move along with the waves, the movement is then used to pump up sea water. The sea water is transferred to the reservoir on the top en of the Cathedral. The water is then situated at a level of approx. 50m. 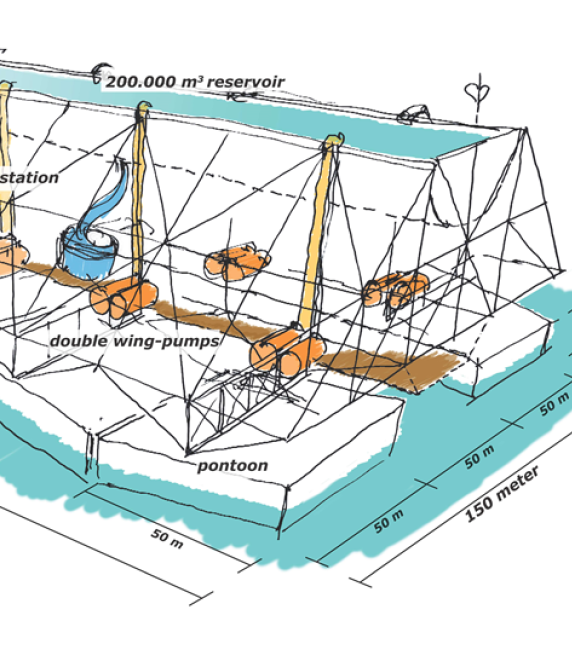 The water will flow back to the sea from the reservoir in a continuous way, while driving a set of hydro turbines. This way, the continuous water flow delivers a continuous power output. The whole construction a very large, approx 350 meter in length; the size of three soccer fields. It delivers approx. 50MW of energy , which is sufficient for 150,000 households. Due to the continuous power output, it also delivers the same output as a wind park with twice the installed power and a footprint of 24km2.